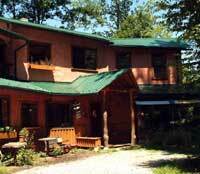 Earthaven’s passive-solar community buildings and individual homes are built of mostly natural materials, usually with lumber milled from trees on the land, and usually with green or red metal roofs for roof-water catchment. We have about 30 natural buildings at Earthaven now. We teach many of the building techniques, mentioned below, at Earthaven. See our Calendar. 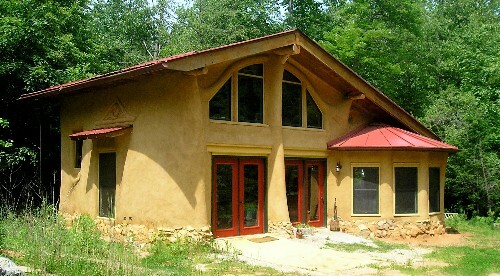 Leela House (pictured above) was constructed by the Natural Building School. Rounded rooms and curves are one of the joys of natural building with earth and straw. This cob dining alcove has a built-in cob bench on the inside, and a conical red roof outside. The north wall of the house is straw bale. 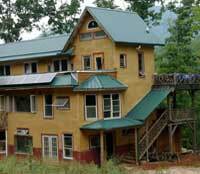 Now under construction, the Earthaven Natural Building School will be a 3,000 sq. ft., three-story building on Hickory Knob near the White Owl Lodge. It will offer workshop and living space for two-year apprentices in fine woodworking and timber-frame joinery, and be partially powered by a stream-side water wheel. Both the Tribal Condo and the Micro Hut are timber-framed structures with lumber from the land and earth-plastered interior and exterior surfaces. Both have walls that combine thermal mass and insulation: the Tribal Condo has clay-straw walls, and the Micro Hut has chip-slip walls (wood chips and clay slurry tamped into wall forms). Our Council Hall is a 13-sided timber-framed structure with straw bale, straw-clay, and cob walls; earth-plastered interior and exterior wall surfaces; and a hardwood floor with poplar and walnut planks from the land. When completely finished, the Council Hall will have radiant floor heating and a living roof. Chuck’s Office is a small timber-framed structure with clay-straw walls, earth-plastered interior and exterior surfaces, an earthen and slate floor, and a living roof. The two-story White Owl (below left) and the three-story, 4,300 sq. ft. Village Terraces (below right) are both timber-framed structures with earth-plastered exterior walls and blown-in cellulose insulation. Medicine Wheel House. The “Pallet Palace,” a 3 ½ story family home offering inexpensive cooperative living, is a stud-framed building made of used plywood from recycled cranberry juice pallets, recycled bridge spans, recycled hardwood floors, blown-in cellulose insulation, and poplar clapboard from trees milled on the land. The Stones’ Earthship is a two-bedroom home that is bermed into the south side of a hill, and has walls of recycled tires filled with rammed earth. Julie and Andy’s House, a two-story, 3-bedroom home for a family of four, has led-in diagonal bracing (not plywood) for shear strength in exterior walls, blown-in cellulose insulation, recycled plywood subflooring, and an earth-plastered exterior.